I can't believe it! My baby turns 9 months old today! How did this happen already? How are we already talking 1st birthday... in 3 months?! Time has been absolutely flying by. I feel like those first few months were sooooo slow and then all of the sudden he was sitting up on his own, eating finger foods and crawling everywhere! Now before I get all weepy I thought in honor of him turning 9 months I would share a few of my favorite items from my registry. I registered for a lot of stuff but these were my absolute favorites that I used daily! Solly Baby Wrap: I can honestly say I would not have survived those first couple of months without this wrap. Derek did not want to be put down (as do most newborns) and with his reflux he did best being upright. I would put him in the wrap and suddenly had two free hands and a very happy baby. Baby wearing has been proven to be so beneficial for both baby and mom and I loved how lightweight and portable this wrap was. It was also the middle of summer so the lightweight cotton was perfect for keeping both of us comfortable. Lifesaver. Graco Glider Lite LX Swing: We didn't have much luck with our (very expensive) Mamaroo but when we tried out this swing it was instant lights out for him. He loved napping in it and I loved that it had a small footprint. Skip Hop Chelsea Downtown Chic Diaper Bag: I love this diaper bag because it's got a lot of pockets to organize all of our stuff but still looks like a fashionable handbag. I especially love the gold accents on it. They now have a backpack version of this bag now which I can see being super useful when he's walking and on the move. Right now you can score this bag for 20% off using code "SWEETHEART" on the SkipHop website! Aden + Anais Easy Swaddle: Like I said earlier- we just couldn't get a good tight swaddle with the blankets and he was constantly breaking free and waking up. Also- not something you want to be messing around with in the middle of the night. The easy swaddle made it... well, easy. Just a couple of snaps and he was snug as a bug. 4Moms Infant Tub: This bath is awesome! It has a temperature gauge on it, a comfy little mat for the baby to lean against and it lets clean water in while letting the dirty water out. Genius. Covered Goods Multi Use Cover: I loved using this cover for the car seat. It was lightweight and easy to keep in my diaper bag and made a nice little cocoon for when he was sleeping in the car seat or for deterring unwanted baby oogling when you're out in public. You can use it for nursing, as a highchair or shopping cart cover or wear it as an infinity scarf. They come in a lot of fun prints too! 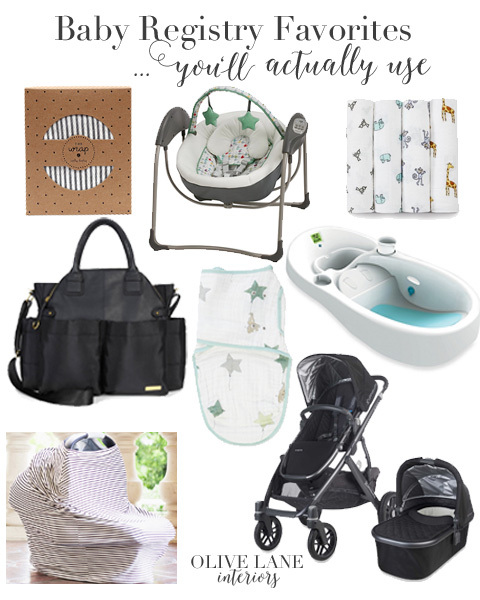 UppaBaby Vista Stroller System: Last but not least my stroller! I loved using the bassinet to take him on walks around the neighborhood and now that he's bigger he loves sitting in the seat- which can face towards you or face out. The super large basket on the bottom is great for shopping and we had the Mesa carseat so it was easy to snap that in and out too. You can also add a second chair or bassinet to it!